For many investors, creating a retirement portfolio can seem like an overwhelming task. Fortunately, the growth of the mutual fund industry and exchange-traded funds have provided individual investors with access to professional investment management. Financial advisors and professionally managed accounts within retirement plans expand the lineup of options available to help investors. Now there is a new kid on the block fully capable of fundamentally changing the investing landscape: "robo-advisors." But there are some important things to be aware of before your incorporate robo-advisors into your investment plans for retirement. The term robo-advisors refers to automated investment platforms using algorithms to match investments based on your comfort with risk and your time horizon. These platforms are referred to by a variety of names such as automated investment advisors, online investment platforms, or digital advice platforms. Online investment platforms, or robo-advisors, are automated investments that were initially launched in 2008 and were offered to consumers on a much broader scale since 2010. Most robo-advisors use exchange-traded funds (ETFs) as their primary investment type. The portfolios generally include a mix of asset classes such as stocks and bonds. Other alternative asset classes such as real estate, natural resources, and commodities are also used by many of these platforms. Despite the fact these digital advisor platforms only manage a small percentage of overall investment assets in our country, they are growing rapidly and will continue to be a part of the retirement planning discussion for years to come. It is estimated that robo-advisors will manage approximately $2 trillion by 2020. As is the case with any new investment, there is often a much-needed debate about the pros and cons of incorporating this type of platform into a diversified investment plan for retirement. A Simplified Approach That Offers Easy Accessibility: Not surprisingly, the ease of online access is a core feature of online investment platforms. Tech-savvy investors enjoy the ability to set up and fund an account through the ease and convenience of a computer or smartphone. Account information is readily available with 24/7 access, and performance updates are provided on-demand. This accessibility extends to the minimum assets required to set up an account and robo-advisors are known for their low minimum investment amounts to get started. Some robo-advisors do not have any account minimums required, drastically lowering the entry point for potential investors. In comparison, many human registered investment advisors (RIAs) normally have higher account minimums which could be $100,000 or more. But many robo-advisor clients prefer the automation of the account setup process. After answering a series of introductory questions designed to assess your risk tolerance and goals for your investments, suggested portfolio allocations are presented to investors with an option to update the allocations to assume more or less risk. Efficient Investing: The process of building a diversified investment portfolio is a significant advantage for robo-advisors. The account setup process usually takes minutes, and knowledgeable investors with a do-it-yourself mindset usually appreciate the ease of executing trades. Many financial advisors are adopting the use of automated investment platforms to improve the efficiency of their portfolio management services. Instant Diversification: One of the most important benefits of using an automated investment platform is the ability to invest in a diversified portfolio that is typically based on modern portfolio theory research. This approach focuses on your overall allocation to major asset classes such as stocks, bonds, and real estate. Access to Low-Cost Investments: Online investment platforms generally provide a lower cost alternative to traditional asset management firms. Without the additional expense of brick and mortar locations and fewer human employees, robo-advisors typically perform similar investment services for a lower overall cost. The average fees usually range between 0.2 percent to 0.5 percent of total assets under management. Compared to a typical asset under management (AUM) fee of 1 percent to 1.5 percent charged by financial advisors the lower fees could result in significant savings when compounded over time. Tax-Loss Harvesting: Many automated investment platforms offer tax-loss harvesting for taxable accounts. This is a process of offsetting capital gains through the sale of another investment to generate a loss. The tax-loss harvesting process has the potential to enhance after-tax returns. But tax-loss harvesting doesn’t necessarily help every investor. For example, investors in the 15 percent tax bracket are taxed at the 0 percent rate for capital gains. Unbiased Investment Advice: Human financial advisors are subject to the same behavioral biases that can derail the investment plans of individual investors. In contrast, online investment platforms can help eliminate the potential for advisory firms to recommend their own products or let self-serving biases influence investment recommendations. 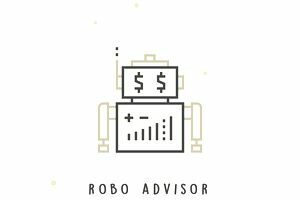 Most Robo-Advisors Lack Personal Guidance: While some hybrid advisors offer a robo-advisor with a human component, most automated investment platforms do not provide access to Certified Financial Planner professionals. Take into account if the robo-advisor offers access to a human advisor through phone, email, online or video chats. With financial knowledge at such low levels in our country, robo-advisors assume their clients have a well-defined set of financial life goals. Investment Advice Is Only One Component of a Financial Plan: Preparing for retirement is the most common financial goal and the primary reason why people invest in the first place. However, if you have other financial goals such as saving for your child’s college education, paying off debt, or investing in a beach cottage, your investments need to be structured differently based on those goals. So far there aren’t any robo-advisors that possess the capability to adequately assess whether it makes sense to save for emergencies, pay down debt, or invest for long-term goals such as retirement. Automation Does Not Eliminate Irrational Decision-Making: Online investment platforms may help people create automated investment plans, but as mentioned above artificial intelligence cannot currently replace financial planning guidance. Behavioral finance experts frequently point out that the human condition makes it difficult for us to make rational financial decisions consistently. While automation of the investment process is made easier through digital advice platforms, these robo-advisors do not eliminate the possibility that you will make an emotional decision with your investments. Many Digital Advice Platforms Lack Intuitive Risk Tolerance Assessments: The process of determining an investor's tolerance for risk is based on scientific principles and research. For many, the types of questions asked to require at least a fundamental level of financial knowledge to relate the questions to real-life scenarios correctly. Most automated investment platforms use a brief online questionnaire to assess risk tolerance and goals. However, there are multiple components of risk involved with the investment process, and no single risk measurement tool exists that can claim 100 percent accuracy in assessing risk. As such, many financial planners and investment professionals would agree that a more in-depth discussion is needed to capture your risk tolerance as an investor fully. They Do Not Have a Long-Term Track Record: Because online investment platforms have only been around for less than a decade, some investors are skeptical about their long-term ability to weather market downturns because they haven’t been tested during extreme periods of market volatility. That being said, the algorithms they are built on have been used to back-test portfolio performance during a variety of different market conditions. But as the adage goes, the past is not a predictor of future performance. Not All Robo-Advisors Offer Retirees Guidance Generating Income Through Drawdown Strategies: The main purpose of saving for retirement is actually to be able to use those funds during retirement. While robo-advisors are most popular among Millennials and Generation X, there is a growing interest among Baby Boomers as well. However, as Boomers enter the distribution phase, it is important to use a drawdown strategy that is both tax-smart and focused on maximizing income. Retirees have to be cautious when choosing a robo-advisor because some digital advice firms provide this type of guidance while others do not.